It is uncertain where the French Press originated. Both the French and the Italians claim to have invented this method. The French tell the story dating back to the mid 1800’s of a distracted man that normally boiled water and coffee grounds together. Being distracted he boiled the water but forgot the grounds. Not wanting to let the boiled water go to waste he added the grounds to the already boiling water. The grounds eventually floated to the top and the frenchman had to find a way to filter the water to be able to drink it. Using a mesh of equally unknown origin he pushed the grounds down into the water and the French Press was born. In the late 19th century two frenchmen, Mayer and Delforge, filed a patent. In 1929 the Italian Attilio Calimani filed a patent for a refined design of the same principle. He described a metal pot with a plunger operated mesh strainer using a rubber edge or a flexible spring to scrape the inside of the pot. Later, in 1935, Bruno Cassol filed a patent for a renewed mesh that is still being used today. Later still, in 1958, Faliero Bondanini filed a patent of his own before starting mass production in a french clarinet factory. The French Press has different names around the world. In Italy it’s called a “caffettiera a stantuffo”, the Dutch and English “cafetière”. New Zealand, Australia and South Africa call it a “coffee plunger” and the resulting brew “plunger coffee”. Ironically the French don’t call it a French Press at all but “cafetière à piston”, which roughly translates to coffee plunger as well. The French Press is a very simple device that yields a very rewarding cup of coffee if used properly. It isn’t too difficult to use though. Basically coffee grounds are added to water that is just below boiling temperature. The coffee is then steeped in the water for a set amount of time before pushing the plunger down and pouring the brew into a cup. Boil more water than you need, some of it will evaporate! Lost 0.07 grams in the grinder. If you’ve brewed more than you can drink in a reasonable amount of time you can either skim the grounds off the top of the water before pushing the plunger down or pour the brew into a thermos. Leaving the brew and grounds in the French Press after the 4 minute mark causes over-extraction resulting in a strong but very bitter taste. When skimming the grounds before plunging, don’t worry about getting absolutely everything out. There are a number of variables in the process above, starting with the coarseness of the grind. If you find a lot of sediments in your cup you’ve ground the coffee too fine for the mesh on your plunger to filter. A watery taste is generally caused by grinding too coarse. 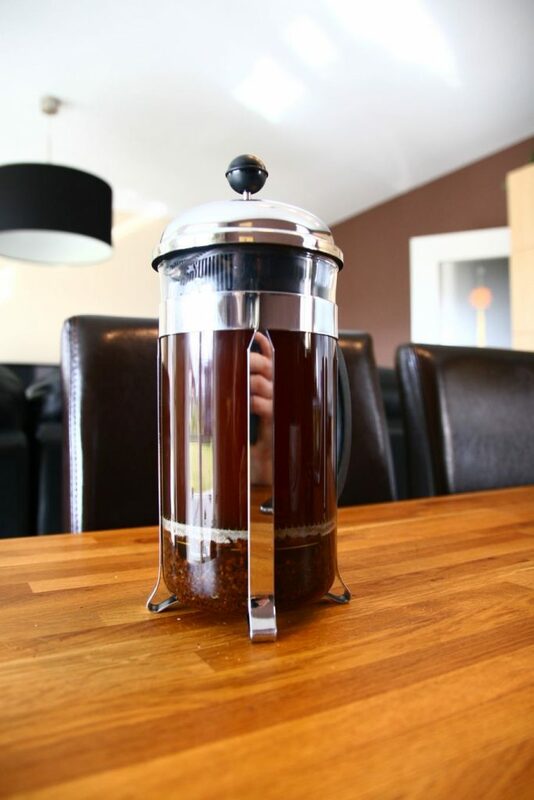 Be aware though that French Press coffee is generally not as clear as a filtered extraction. The second variable is the water to coffee ratio. A general rule of thumb is to start with a 1 to 17 ratio. 1 scoop of coffee to 17 scoops of water. 1 Gram of coffee to 17 grams of water. For my 900ml French Press that results in 900 / 17 = ~52 grams of ground coffee. Obviously if you dislike the taste you can adjust up or down from there. The third variable is the brewing temperature. In step 3 we let the boiling water cool down a bit to about 90 – 95C or 195 to 202F. If the water is too hot it will dissolve certain acids from the coffee that result in a very sour taste. Some people also agitate the coffee by stirring it during the 3 – 3 ½ extraction window. If and how much you stir is entirely up to you. Stirring cools down the water and causes different acids and flavours to be released during the extraction. As I mentioned before the French Press brewing method results in a less clear, more muddier coffee than methods that use a filter of sorts like pour-over or drip methods. The mesh screen on the plunger serves as a filter of sorts but isn’t fine enough to filter all the smaller particles out like a paper filter does. There are 7 more articles in the Brewing Methods series: The Moka Pot, The Vacuum Coffee Maker, Turkish Coffee, The AeroPress, Hario V60, Cold Brew Coffee and Espresso.